It started when I realized that the blog feed was not working, so my April fools post – which was actually created on April 1st – was delivered on April 2nd, if at all. Well… that sort of killed the joke, eh? Having chewed on that problem for a bit, I headed out to the kitchen. 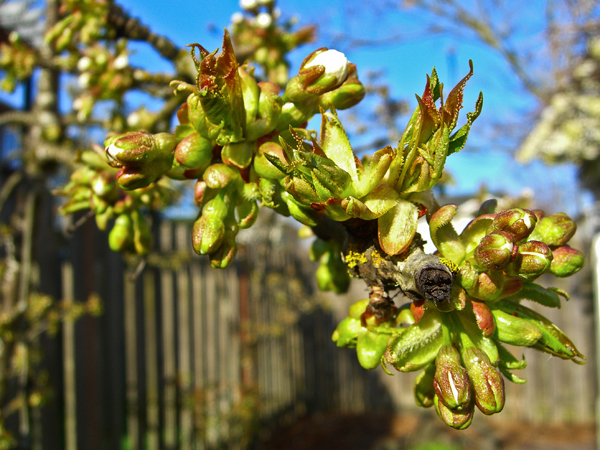 There I popped a cup of coffee in my old, trusty microwave to reheat, while I gazed out the back door on my yard – sunny and, dare I say, springlike? The picture shows what my yard really looks like today. See the blue, blue sky and the cherry blossoms about to pop? Ah… finally. The snow picture was from January, 2007, and I do not want to see that return. As I stood contemplating the return of spring, I heard what can only be described as a groan behind me. A groan, and then a thud, and then silence. I turned in horror. The microwave had died. It completed its mission to heat my cup of coffee. And it was dead. As dead as Marley’s ghost. Deader, actually, as Marley’s ghost could speak and rattle his chains. But Micro (as it was known to friends and family), could do neither. It was as dead as a doornail. And why, gentle reader, do we use that phrase? Are doornails any more dead than, say, door knobs or window sashes or venetian blind slats? It seems they must, somehow, be. But I digress. Since the demise of the old refrigerator, Micro has been the oldest of my major appliances. It has been my good and trusty servant for 20 years (it was actually older than #1 Son). In its youth, it was quite something – a combination microwave/convection oven that was rather expensive when purchased. I felt very proud when it came home to my kitchen. It had been repaired once, under warranty, but since then it had never missed a beat. Many a healthy and tasty meal were cooked in it, and certainly I got my money’s worth out of it. But in latter days, in deference to its extreme old age, it was more likely to warm a cup of coffee or pop the occasional bag of popcorn. The last year or two it has made some sort of strange noises now and again. But it kept right heating up whatever I tossed its way with few complaints. Although I knew that in microwave years it was an ancient beast, it seemed to be one of those eternal things that are always there. I assumed that someday #1 Son would come to take care of my worldly possessions when I no longer needed them, and would find a good home for Micro. I just never expected to have to replace it. Poor Micro. The groan it gave as its last gasp was truly pitiable. Thus I contemplated its life and mourned its death as I sipped my piping hot cup of coffee. Thank you, Micro, for warming my morning. 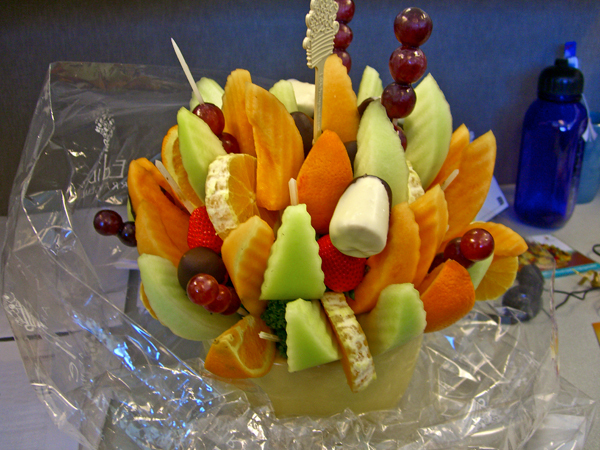 Tomorrow is one of my colleague’s birthday, and this fruit bouquet was sent to mark the occasion. Isn’t this just yummy? What a good idea instead of flowers! The card said that it should be eaten within 4 hours, and so my colleague asked us all to help out. Who am I to turn down such a heartfelt plea? The fruit fueled my after-work excursion to the local big-box store in search of a new microwave. Not a replacement, mind you, because nothing could replace Micro. But a new one that could do the job. I found that the state of the art has progressed somewhat over the last 20 years. Microwaves are smaller, lighter and have tons of features for a rather small price. I was pleasantly surprised. I opted not to get one that has a convection over in it. I really haven’t used that feature much and I didn’t want to pay extra for it. But I found a nice, medium-sized microwave and brought it home. The new microwave and I will need to get used to each other. In Micro’s honor, I decided to start with a bag of popcorn. The first bag was… burned to a crisp darned near burned the kitchen down set off the fire alarm a bit over-popped. The second bag was much better. I believe that, over time, we will grow used to each other’s ways. If I am lucky, this microwave will last even 1/2 as long as Micro did. I do feel badly about missing Wednesday night knitting. Next week, for sure. My dishwasher died the same day as your microwave, so I feel your pain. At the appliance store they had a sign saying the average life expectancy for new appliances. Sorry to tell you that you can expect only 3-7 years from your new microwave, maybe 10-12 from the new dishwasher. That means that every year one third to one seventh of all microwaves in America are being thrown out. Imagine the pile of one tenth to one twelfth of all dishwashers in the landfill. They don’t make stuff you can buy parts for and fix anymore. Alas, poor Micro. Is there a warning for me in your experience? My microwave, Amana ’78 (not a typo), is still going strong, though I probably don’t work it as hard as most people do. I suspect the days of anything lasting 20 or 30 years are long over. Alas, indeed. I always worry when I hear about other’s appliances demises…I hate trends. Congratulations on your new purchase! I love my “smaller” microwave (which replaced my first that was about your Micro’s vintage). However, that one is now…hmmm…15 years old? Maybe not quite. Poor Micro. I must say that your Micro lasted a lot longer than most relationships do. Hopefully it’s replacement gives you a good faithful 20 years as well. I have one of those micro/convec things from the early 80s â€” 1982, was it? I loved the convec feature until it died. Thankfully, the micro still works, but yes, they’ve drastically changed the power on those things over the years. Mine makes groaning noises too, the same kind I make when I get up after sitting for a long time. Don’t throw the old thing out yet! The older Micro might have a chance to be brought back to the land of the living. It might cost some, but out there somewhere is a repair shop with a balding middle aged repair man who hordes parts, and could fix the ancient cooker. At least you could justify keeping it by saying it can cook with convection, and the new one cannot. Then it could be passed on. Save the elderly appliances!